Not bad for a guy whose claim to fame before A. Ham was having handled social media for a show called 50 Shades! The Musical, which Karns says “is laughable, now, to look back on.” The turning point? A meeting, set up through a mutual friend, with Jeffery Seller, the Tony Award-winning producer of Hamilton. “I happened to meet him at a time when he was really interested in finding someone new to run all of his social and digital efforts, so it was sort of serendipitous,” Karns said when we caught up with him by phone recently. “I picked his brain about producing” while also mentioning his social media work with 50 Shades! Before long, he was on board as Sellers’ social media guy. A few months later, in February 2015, Hamilton premiered at New York’s Public Theater and Karns’ profile took off from there. He shudders to think of where he might be without Hamilton. He still has a goal of producing his own Broadway show, and toward that end he’s taken on jobs with that type of project in mind. Connections he’s made through his work on Hamilton led to his involvement with Great Comet. At the moment, he’s in the process of developing a winter concert in New York that hopefully will tour nationwide. And, of course, he’s looking for his next Broadway project. How long Hamilton lasts is anyone’s guess, but Karns couldn’t be happier with his role in its legacy. And so what ends first, the show itself, or Karns’ time with the production before deciding to move on to other projects? Entry filed under: Alumni. 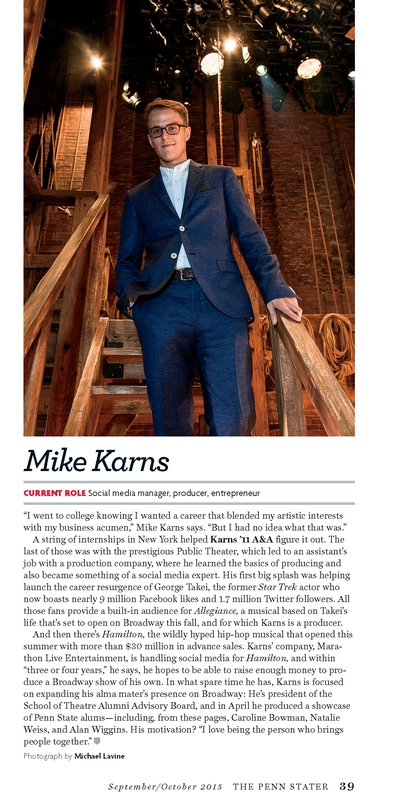 Tags: Broadway, Hamilton, Mike Karns, Penn State School of Theatre.